Tigers & Strawberries » Pork & Nail Polish: Two Great Tastes? I clicked on the link to Copyranter’s coverage of an ad that appears in the current issue of Martha Stewart Living (and probably in other women’s magazines) and was completely confused. Yes, it does indeed say Pork & Nail Polish right there, in big print. The juxtaposition of words is–unique, to say the least. And the pork tenderloin cutlets sliced and arranged to look vaguely like manicured fingernails–well, let’s say that nothing in this ad is appetizing to me in the least. All right. Fine. At least there is no mention of using nail polish as a glaze to keep your grilled pork chop nice and shiny. That had me worried–and queasy–but if all we are talking about is a femmy MacGyver sort of thing, I can deal with that. So, I guess it is supposed to be a clever “play on words” sort of thing to use the word “fix” to mean “repair” in one context, and then meaning to “prepare” in another context. But, I have news for whoever put this ad together. I am not about to go out and buy pork because of this. I am not going to want to buy pork because of it. In fact, I am more likely not to buy pork because this is just so dumb on so many levels. It isn’t clever. It isn’t well-written–what is up with the 1950’s style confession and the use of out-dated slang words like “lickety-split” and “handy-dandy?” This ad isn’t retro-hip, it is dim-witted and squaresville, daddy-o. This ad is definitely crossing and whoever came up with it is Herbert. That would have just been too much to bear. Great commentary! I just saw this in a magazine the other day and was so turned off by the juxtaposition of those two items. Eww! So insulting, isn’t it? I despise that “Girlfriend, Can we talk?” dialog. Most women I’m familiar with know the difference between nail polish and duct tape. To appeal to people they should focus on health, prep time, and versatility. It is a little cheesy. Obviously geared toward women who haven’t considered pork as anything other than a plain boring manly pork chop. 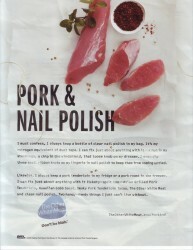 And the “pork and nail polish” slogan is certainly eye-catching (as well as gag-inducing). 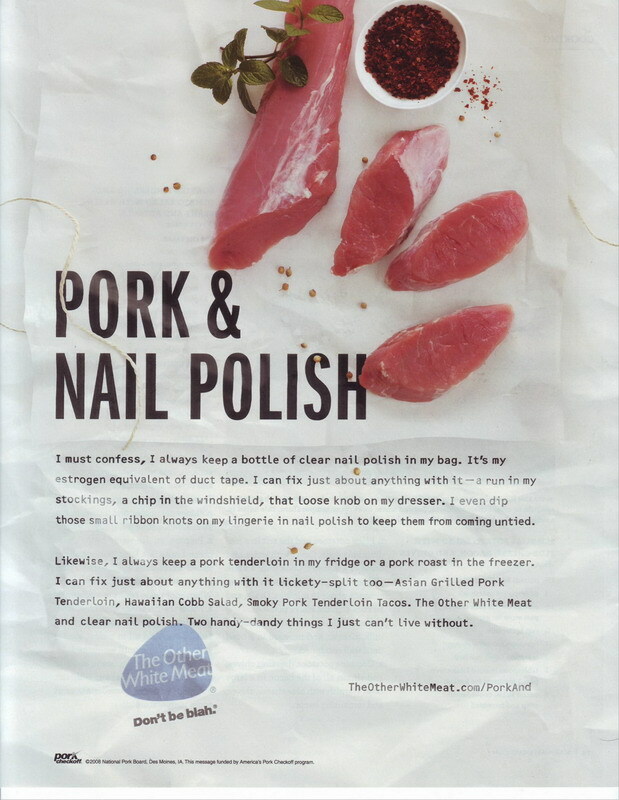 But surely there are better ways to portray pork – like not as fingernails (which is interesting but rather gruesome). My estrogen equivalent to duct tape? Duct tape. It’s gender neutral. Want me to buy pork? Then show me delicious pictures of tasty pork recipes. Yum! Thanks for explaining that those were supposed to be fingernails. I looked and them and saw, well, pork. The thought of pork and fingernails grosses me out though – the same way the concept of hotdogs does, I guess. And now I’m really grossed out. Wow. This ad really is a failure in all ways. snerk. I saw this ad too, in some other cooking magazine, and just about died laughing. I mean, really…. raw meat and fingernail polish? really? someone got paid for that???? My vegetarianism, and nail nakedness, are both reaffirmed. Bwaha hahahahaa! This post made my morning. Hilarious and right on the money. To think that this ad was approved by a boardroom of people as a great way to promote pork and appeal to our “femininity” is just insane as well as thoroughly unappetizing. Alexis E’s comment made me think about advice I’ve heard to put raw meat between you and the saddle if you’re experiencing really bad saddle chafing in the middle of a long bike ride. Tenderloin for your tender loins, eh? That sounds…. like some horrible and weird infectious disease waiting to happen. I hope that people who decide to sit on a strip steak leave it in the plastic wrapping…… blecch! Ick. This makes pork sound really unappealing. Granted I don’t like it much to begin with and never want to buy it. But whenever I read Chinese cookbooks (or Nigel Slater) I just want to run out and buy pork. Lots of pork. So it can be done. Just not this way. What. That is so bizarre. That is so funny. My friend Nick (who does not like pork) says that pork makes you dumb…it must be true! I imagine I’m not the person this ad targets (if this person even exists)…I have no clear nail polish in my house or at all and I buy pork all the time, mostly because it is delicious. And I say this as a former vegetarian! I saw this ad too and was annoyed. Your post is great!!! What are we dimwitted, manicured, vapid martha-clones? The next ad will be kotex and bacon grease- excuse my vulgarity but that’s what it made me feel like…. stifle the little woman. Well this is just gag-ariffic. Blech. And I like pork. That ad is wrong on so many levels. Ick, ick, ick. Is anyone else getting severed finger vibes from that picture? My mind is going sliced pork + fingernails = sliced fingers. And it’s like going back to the 1950’s where all women were good for was cooking and looking pretty. Oh wow … so many of these comments are so true. But I have to agree that Amy’s “duct tape is gender neutral” is the best. And I am soooo going to post about this ad, myself, too! Thanks for sharing about it. Wow, all of you people have WAY too much time on your hands, I was looking for a picture of raquel welch and came across this article. It is ridiculous to see so many people responding negatively to an add that is clearly meant for a younger generation that may not yet know the their way around the cooking world. And I say this as a G.E. principle advertising specialist! Don’t be so negeaive!